Potassium deficiency is characterized by a cupping or “puckering” of leaves and affects older leaves first. 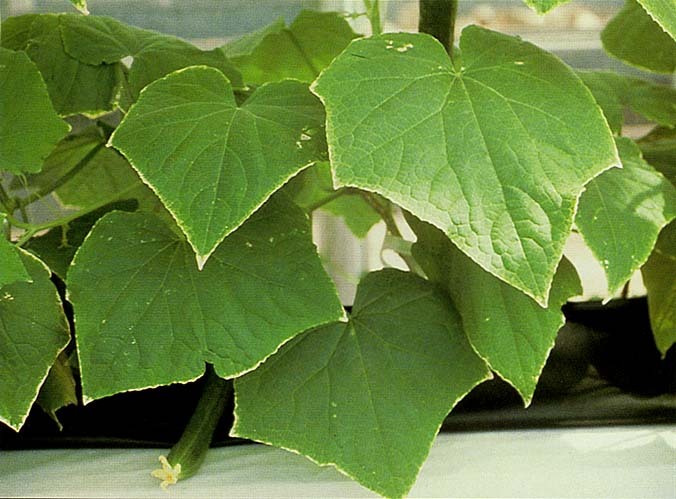 Leaf cupping is usually accompanied by a slight marginal chlorosis, with the leaf margins dying especially at the tip in severe cases. 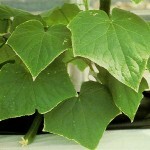 Leaf symptoms are accompanied by abnormal fruit development, cucumber fruit often developing a brown or spotted appearance and melons often developing abnormal flesh texture and off flavor. Conduct soil and/or foliar nutrient analysis to confirm that the problem is nutritional. Follow recommended practices for fertility using a balanced fertilizer and treat for alkalinity or acidity as needed.